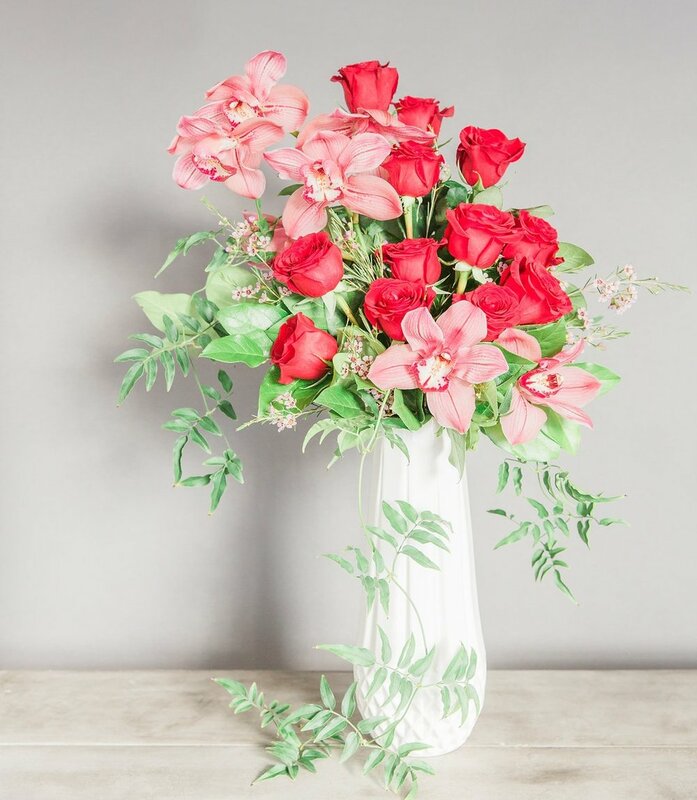 "Love You This Much" with Pink Cymbidium Orchids and Red Roses in an elegant white ceramic vase with a geometric pattern and gold lining. Are you ready for Valentine’s Day? We are. Love is definitely in the air at J. Morris Flowers. Not just romantic love, but also love for friends and family. Myriam and Katie and I had so much fun working on our collection for this year. We have chosen some beautiful vases to go each of our designs. We know you're going to love them. Yesterday, we did some unofficial market research on Facebook featuring four of our V-day designs. Nearly 40 women responded to the polling (next time we want to hear from the guys). The winner, was an all pink, kind-a-glam design in a matching metallic vase. We call it “Mon Cherie.” And to be honest, we are in a bit of a conundrum. Men don’t always select the designs that we think most appeal to our female customers. This all-pink arrangement just might get looked over during the selection process. So what's a girl to do? Send “Mon Cherie” to a friend. Here’s a question though. 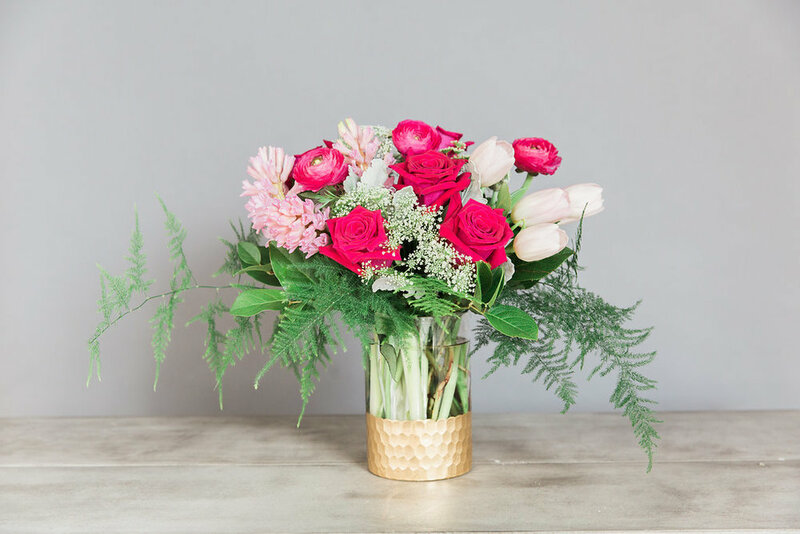 What’s wrong with giving a hint or two about Valentine’s Day flowers to your beloved? Like jewelry, coffee flavors and sweaters, we have to “educate” our spouses and partners about our preferences. Let’s face it, some of us spend years trying to get the point across. How many times has my sister Heather coughed into her hand, sputtering the words “yellow roses” before her June anniversary. Can you guess how many red Roses I have arranged for her? Maybe you haven't really settled on your own floral preferences because you frankly like them all. Take some time to peruse our designs, we’ve added a little bit of information that you may find helpful. Pay careful attention to the vases, we really want to send you something you can use again and again. We can also make a design specifically for you. If you call Micaela, our Front Desk Concierge, she’ll help you choose your favorite vase and color palette and place your order over the phone. J. Morris Flowers at the Unveiled Bridal Show, Washington D.C. But Valentine’s Day isn't the only thing going on in the studio this month. Th team and I spent Sunday afternoon at the Unveiled Bridal Event hosted by Washingtonian Bride and Groom Magazine at the Mandarin Oriental in D.C. This was a really amazing event with a wonderful group of vendors. The team at the magazine is incredibly hard working and creative. We really wanted to showcase what we can do technically with our exhibit while displaying some of our favorite flowers. The magazine editors chose a beautiful color palette, leaning on a lot of green and gold. We wanted to make sure that our florals “fit” while adding some interesting and trendy colors for 2018. We added some warm pink, cream and a caramel colored rose called Combo Rose. Here’s a short video preview that we shared before the event detailing the varieties that we selected. Then, with at least a thousand stems, blooms and greens, we designed our installation, centerpieces and bouquets to fit in an 8” x 8” area. (The only way to get that many flowers into one space is to go up and over.) The bridal bouquets that we made are very lush, full and colorful with a bit of an asymmetrical cascade. We used a lot of Smilax (greenery) because it has such beautiful drape and movement. 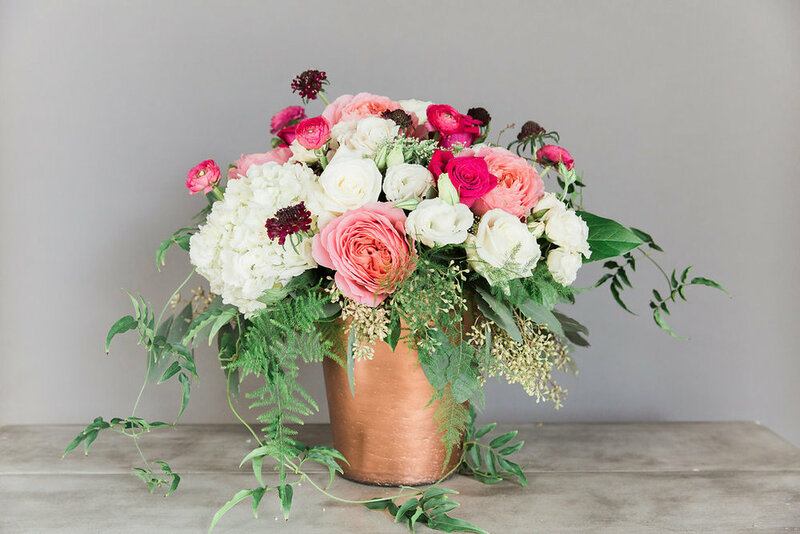 It's a great green to combine with Sweet Antique English Garden Rose because they share such a warm tonality. We also added a softer pink with Mother of Pearl Rose, Cream Stock, Pink Snapdragon, the Combo Rose and pink Spray Roses. It’s nice to be able to work with the rounder roses in varying sizes and the leggier Stock and Snapdragon. It really helps us create depth in our designs which is how we achieve that “just gathered” garden look. We are always really pleased to be the floral partner for Habitat Humanity's annual gala fundraiser. This organization achieves so much for individual families including home ownership and the security and community that comes with it. No small feat, this incredible organization makes this possible right here in Loudoun County and throughout the United States. 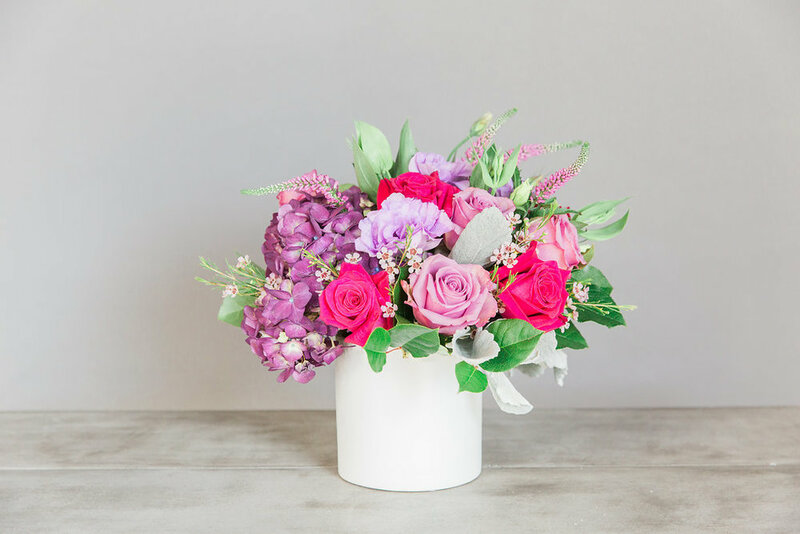 Of course, the team at Habitat has been so lovely to work with, and while I won’t spoil the surprise, we are really excited about the floral designs that we have created for the event. Here’s a little teaser: silver vases, candleabra, stemmed votives (and a couple of ladders), one lush design with just greenery and another with bigger white florals. So modern and tasteful. Much like when we work with brides, we put together a design board for our event partners for our planning meetings. Here you can see the types of flowers and greenery will we use and the decor items that tie the elements together. This event is Saturday, March 3 beginning at 6:00 pm. Tickets can be purchased on the Loudoun Habitat for Humanity web-site. Lastly, you already know what a wonderful team I have at J. Morris Flowers. I wanted to make sure that you knew that we have a fantastic couple working for us who are members of our local community. This is Myriam and Carlos. Myriam is one of our very talented floral designers, and Carlos takes a very big role in operations for our company. They both have years of experience in our industry. Katie, Sofia, Heather, Sarah and Micaela and I are so happy to be working with them.